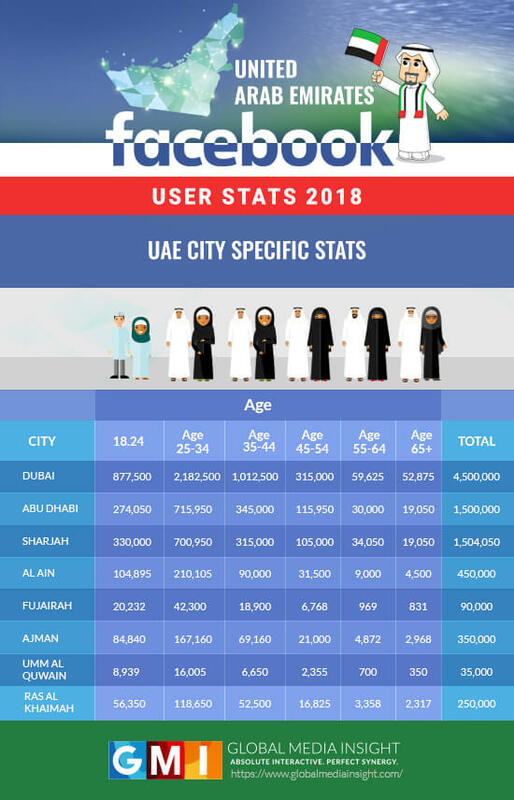 The following statistics contain detailed demographic data on the age, gender, relationship status and academic qualifications of Facebook users in the UAE. You can also find the Facebook usage data for individual Emirates. Consistent with previous years, this year too, Facebook tops the chart as the most popular social media platform in the UAE. There has been a quantum leap in the number of Facebook users. From 3.73 million in 2015, it grew to a stupendous 7.5 million in 2016 and again rose to 8.7 million users in 2017. 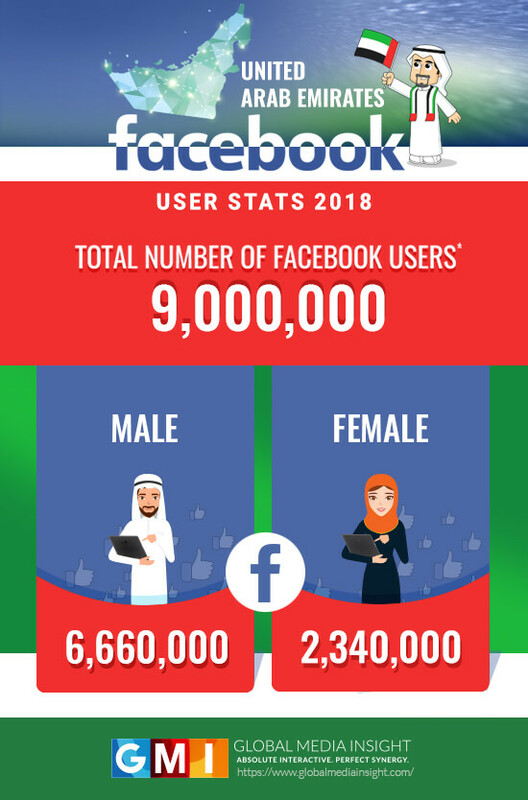 In 2018 the UAE has a staggering 9 million active users on Facebook. In fact, among the countries in the Middle East, the UAE holds the top spot in terms of Facebook users. Male users still constitute the largest portion of the Facebook user base with 6.6 million male users logging on to the platform. Female users account for 2.34 million users in the UAE. Women’s participation on Facebook in the UAE is low at 26%, especially when compared to the global male-female ratio of users, which stands at 50%. 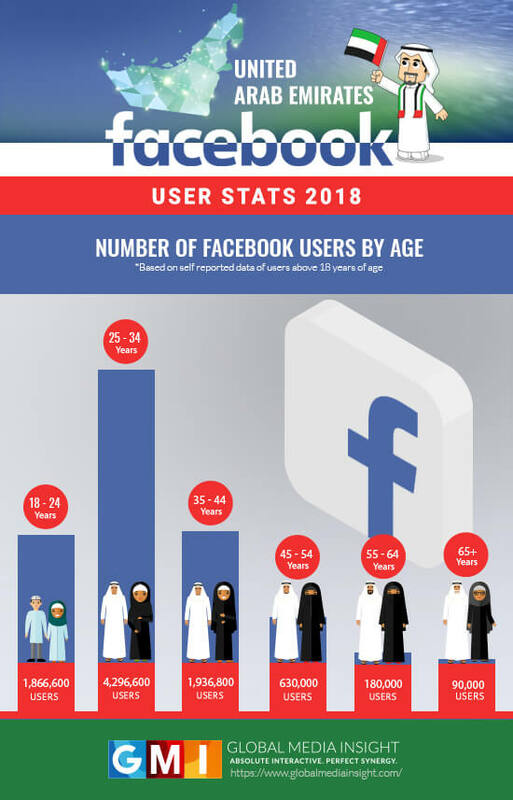 The largest number of Facebook users in the UAE are between 25 to 34 years of age, with 4.3 million users under this age group. This is followed by the 35 – 44 years age group, with 1.9 million users. It can be seen that the age-wise usage statistics are directly proportional to the age-wise population of the UAE. The median age of the UAE population is 33.5, and most of the population falls within the 25 – 34 years range. Hence, the age-wise Facebook user statistics are a reflection of the age-wise population distribution. This pattern is also reflected in the gender-wise Facebook user data in the UAE. The ratio of male-to-female Facebook users almost perfectly matches the male-to-female ratio of the UAE population. 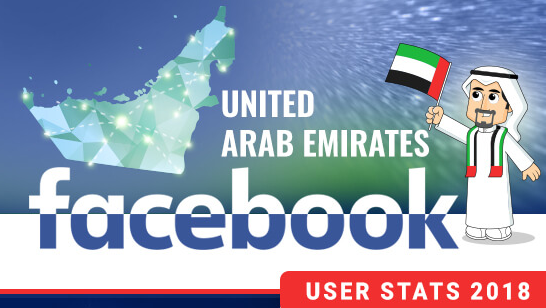 This supports our assertion that almost everyone in the UAE uses Facebook. 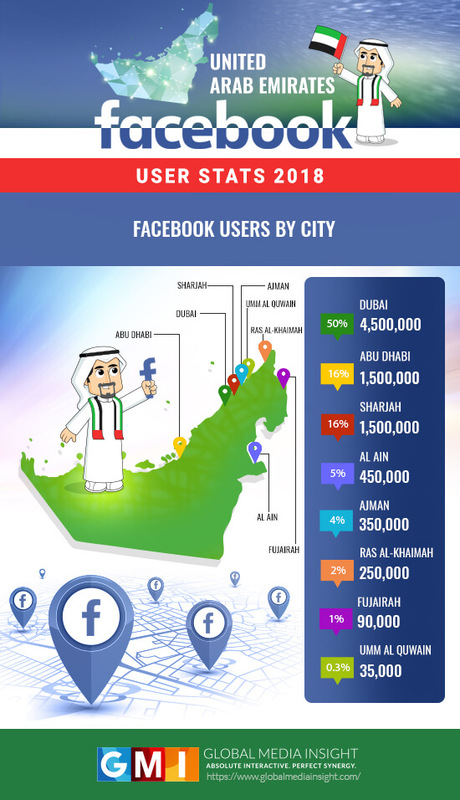 Dubai ranks at the top with 50% of the total UAE Facebook user base, while Abu Dhabi and Sharjah share the second spot with 16% each. But even less urbanised Emirates like Ajman, Ras Al-Khaimah and Umm Al Quwain have shown an incredible increase in users over the lat year. Ras Al-Khaimah had only 190,000 users last year; this rose to 250,000 in 2018. The age-based figures remain almost consistently true across the different emirates. The 25-34 age group has the highest number of users in all the emirates. The second position, though, varies between two age groups. While in Dubai and Abu Dhabi the 35-44 age group has the second largest number of users, for the rest of the emirates the 18-24 age group holds this position. In the last three age groups, the user numbers decrease uniformly with increasing age for all emirates. 82% of Facebook users in the UAE access Facebook only through mobile devices. This closely correlates with the global trend. Globally, mobile devices dominate as the preferred medium to access the internet, especially social media. 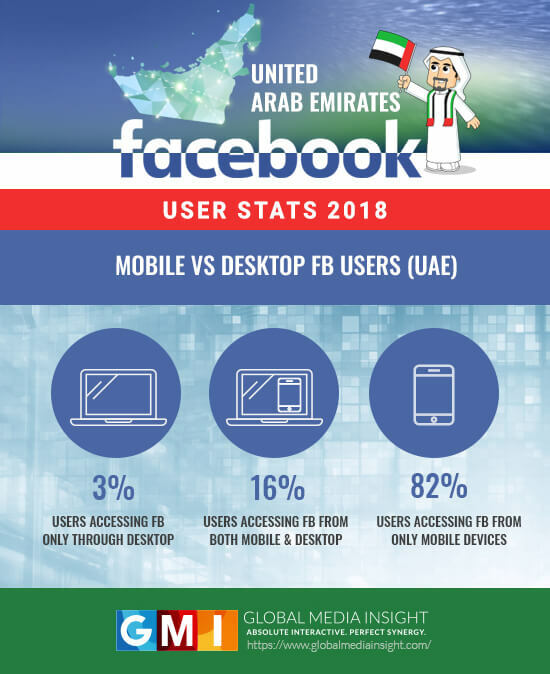 Only 3% of users in the UAE depend exclusively on desktop devices to access Facebook, while 16% regularly use both desktop and mobile devices. 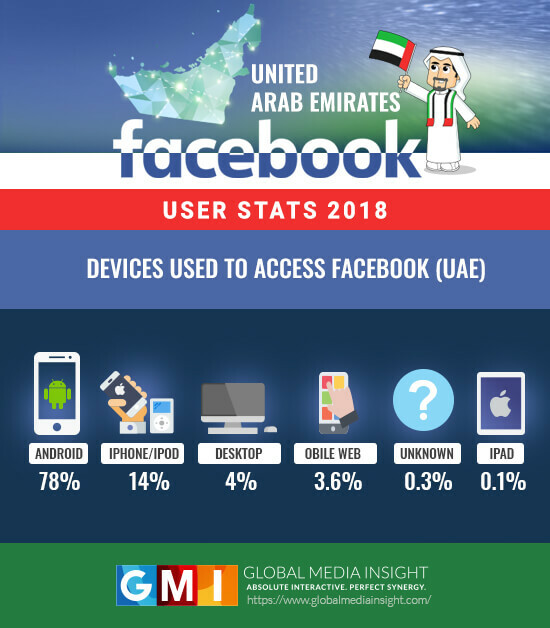 According to Facebook’s audience insight data, a massive 78% of the total Facebook sessions in the UAE originated from Android devices. From this, we can estimate that more than 3/4th of the UAE population prefer Android over iOS. Only 14% of the Facebook sessions were from Apple (iOS) devices. 4% of the sessions originated from computers and 3.6% were from mobile browsers. This indicates that most mobile users use the Facebook apps to access the social network. This data is based entirely on the self-reported data in the Facebook profiles of UAE users. As many users don’t add information about their education levels in their profiles, this data might not be reflective of the actual situation. But it does provide an overall picture about the education levels of UAE Facebook users. 15% of Facebook users have provided “High School” as their highest educational qualification. Beyond this, 77% of users have listed “College” and 8% have listed “Graduation”as their highest educational qualification. It’s worth noting that the educational sector in the UAE has experienced a rapid expansion since education remains a priority of the government. The number of private schools in Dubai and Abu Dhabi is projected to grow rapidly over the next few years in anticipation of significantly increased enrolments. This data is based on relationship statuses provided by Facebook users in the UAE. These numbers are based only on those profiles that list a relationship status. There are users who prefer not to include their relationship status; and such profiles have been excluded from these figures. 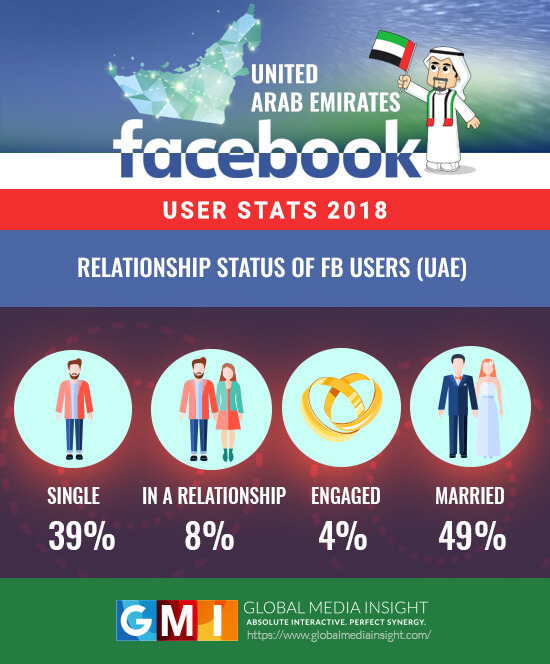 Out of the UAE Facebook users who have provided a relationship status, 49% are “Married”, 39% are “Single”, 8% are “in a relationship”, and 4% are “Engaged”. The numbers and trends indicate that, contrary to the perception of the UAE as a conservative society, social media in general and Facebook in particular is a well-established element in the society, and will continue to play a significant role in shaping the lives, relationships, and decisions of the people in the UAE. 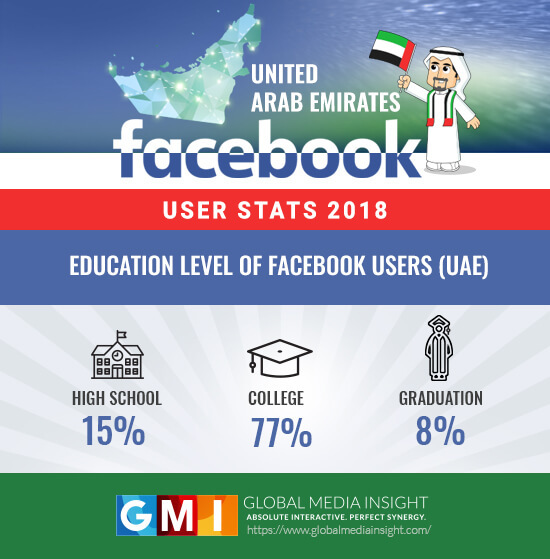 Tap into the massive Facebook user base in UAE with GMI’s Facebook Marketing services .With over 16 years of experience in digital technologies and Social Media Marketing, we excel at driving engagement by optimizing your business’s reachability and connections. We can help you in increasing your engagement and in creating a buzz around your brand. Get in touch with us to create effective Facebook marketing campaigns that drive conversations.